Ride the Flavour's second recipe: Makis-Sushis! 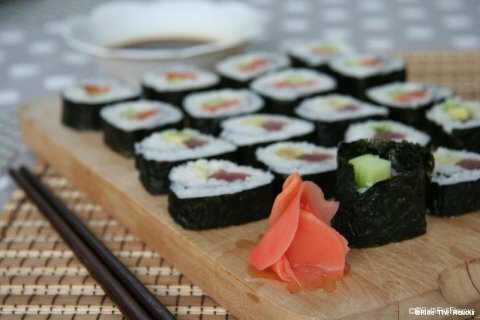 Recipe : Maki Sushi ! You saw it on the itinerary; we will not go to Japan… But we do not want to deprive you of their delicious makis sushis. Here is the recipe! 1) Cook the rice with the double amount of water (1,2L). 2) Heat the vinegar with a teaspoon of sugar and a pinch of salt. 3) Pour the vinegar on the cooked rice and mix it delicately. Leave aside until the rice become lukewarm. 6) Roll it using the bamboo mat and cut it into 1cm pieces. That’s it! You can eat your makis sushis with soy sauce mixed with wasabi !